How Starwood is giving back in New York City. This morning, after waking up at my apartment in Brooklyn, I drank a bit of coffee, showered and dressed, and got on the subway, headed first into Manhattan and then uptown to East Harlem, to cover the kick-off corporate social responsibility event for Starwood Hotels & Resorts Worldwide‘s new “Get More for Your Meeting, Give More to Your Community” promotion. The event was co-sponsored by PepsiCo, which is a partner in Starwood’s new promotion, offering planners 4 percent off their master account, a free PepsiCo F&B break, and a signing bonus of up to 100,000 Starpoints for qualifying meetings that are booked by July 31 and held no later than December 31 of this year. But that’s, as they say, not all! As such, Starwood is hoping to encourage that spirit in meeting planners and their organizations by running a charity sweepstakes alongside the “Get More, Give More” promotion. Planners who book a qualifying meeting will be entered into a drawing for one of four $50,000 grants provided by Starwood and PepsiCo to the planner’s preferred local charitable organization. “We are proud to bring the spirit of our new meetings offering to life today by taking time to give back to the community in a meaningful way — and hopefully, we’ll encourage others to do the same,” said van Paasschen, who made it to the community service event (and gamely hoofed it around East Harlem) in spite of still being somewhat hobbled by a recent knee surgery. Starwood and PepsiCo practice what they preach, too: After a few brief remarks, van Paasschen and Margery Schelling, chief marketing officer for PepsiCo Foodservice, presented the New York Restoration Project, an organization started in 1995 by Bette Midler, and on whose behalf the 100 Starwood associates were about to get their hands dirty, with a (big) check for $50,000. Starwood CEO Frits van Paasschen, far left, presents a check for $50,000 to New York Restoration Project board member Sarah Nash, second from left. 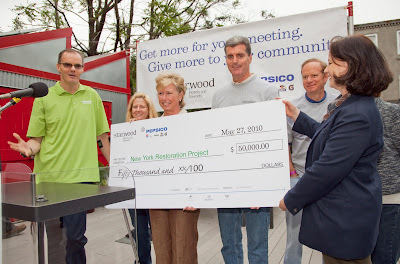 Workers for the New York Restoration Project, a non-profit “dedicated to reclaiming and restoring New York City parks, community gardens, and open space,” were on hand to guide the Starwood associates in their clean-up efforts. “Color Captains” led teams of associates to five different sites in East Harlem to weed gardens, plant trees, pick up trash, and more. One pair of Starwood team members, Trina Mapa, in revenue management, and Cecilia Rueber, a sales analyst — who, though laughing and joking with each other like old friends, had previously known each other only “through email” — had, right before I spoke to them, just planted a new dogwood tree in front of Mount Pleasant Senior Housing on East 116th Street. Remarked Mapa, who lives on Manhattan’s East Side, “It’s fantastic to get out [of the office], help the community, and clean up New York.” Mapa and Rueber chatted with me for a bit longer before getting back to work, patting down fresh soil around their new dogwood tree. 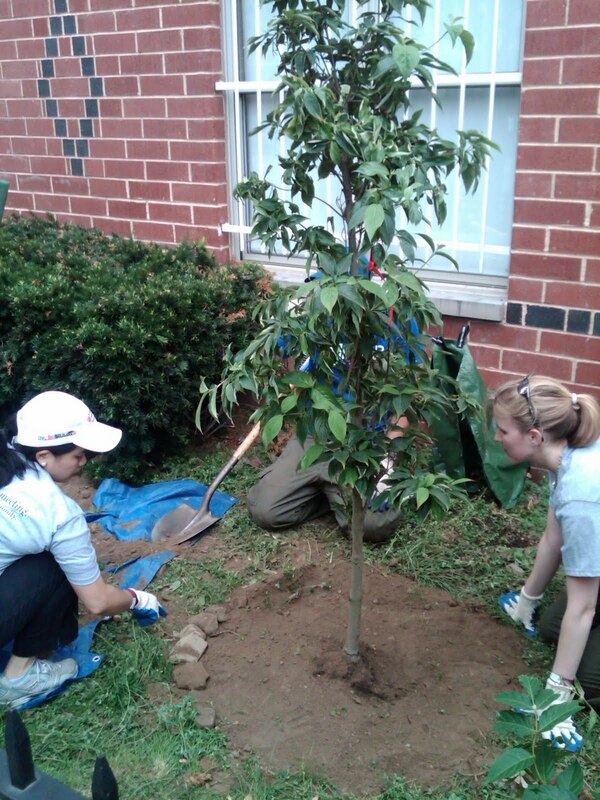 Starwood associates Trina Mapa, left, and Cecilia Rueber, right, with their dogwood tree (that’s a New York Restoration Project worker behind the tree).